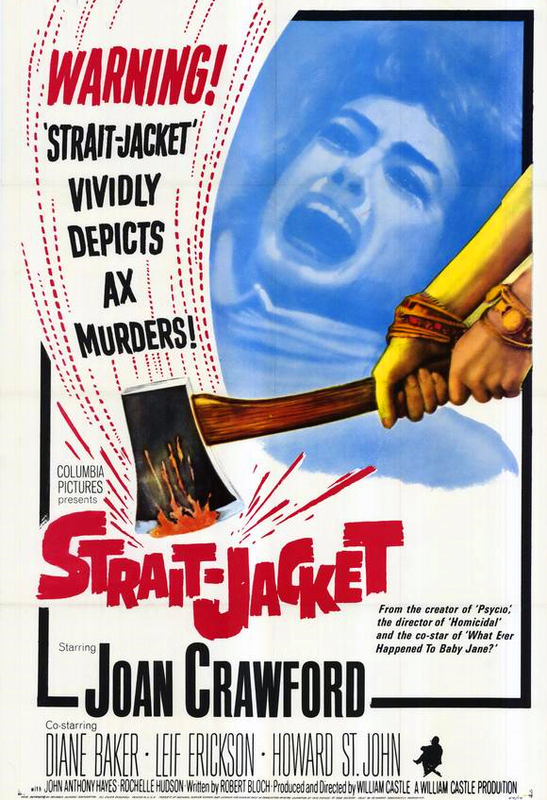 Synopsis: Alonzo the Armless (Lon Chaney) is a knife-thrower in love with the circus master’s beautiful daughter Nanon (Joan Crawford), who happens to have a pathological fear of men’s hands. Sounds like a match made in heaven, right? There’s one catch: Alonzo isn’t really armless. He’s a fugitive with a distinctive double thumb on one hand that would instantly identify him to the police if revealed. Alonzo becomes Nanon’s confidant and commiserates with her over the forcefulness of Malabar the Mighty (Norman Kerry), also devoted to Nanon but shunned by her due to his frightfully strong grip. After the circus master discovers his secret late one night, Alonzo uses his hands to strangle his boss to death, accidentally revealing his deformed thumb – but not his face – to Nanon. Knowing that she could never love him if she knew that he was the man who murdered her father, Alonzo realizes that if he ever wants to win Nanon’s heart, his arms have to go. 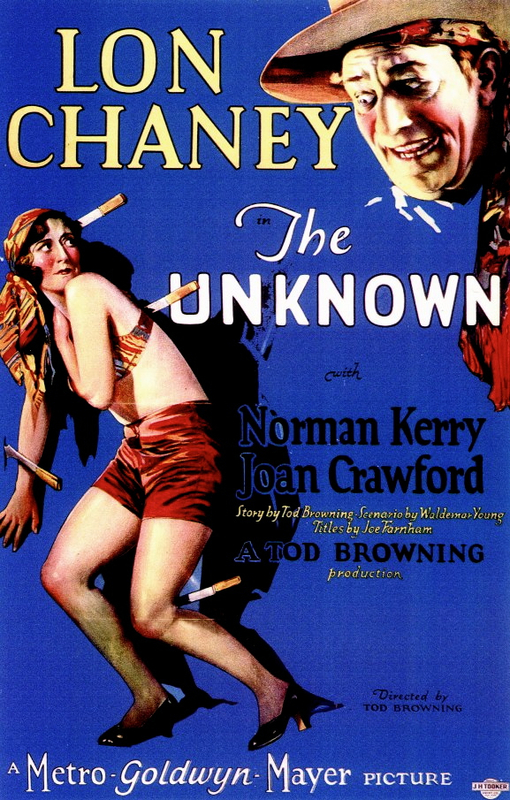 Tod Browning (who also made 1931’s Dracula and 1932’s Freaks) is my favorite director, and in my opinion The Unknown is his best film. I recently had the opportunity to see it on the big screen at the American Cinematheque’s all-too-brief Browning retrospective and was dazzled anew at just how stunning a picture it is. The sixth of ten collaborations between Browning and Chaney before the latter’s untimely death at the age of 47 from lung cancer, The Unknown epitomizes the style of film the duo were known for, the style they created: the horror film that tells the story of a deformed, mutilated, or otherwise physically disfigured character, which seeks to probe the darkest corners of the human psyche, and to push the boundaries of what movie audiences and critics alike can stomach. At the same time that Chaney’s remarkable abilities to twist and transform his visage are on display, his incredible range as an actor also shines through brilliantly; despite the shock of the horrific and outlandish character that he plays, it is this aspect of Chaney which ultimately leaves the most lasting impression in The Unknown. Is he amused? Devastated? Enraged? All three! I have to admit that I’m a big fan of “weird” movies, and The Unknown definitely fits the bill in that respect. But I’m convinced that there’s really something for everyone here, because it’s a film that’s not just weird, it’s good. Tod Browning never was the most subtle of directors, but he’s at his most effective here, mostly letting his incredibly talented cast do the work. If you’ve never seen Joan Crawford in her flapper days, you’re missing out on a huge part of her pre-1940s career. She’s fabulous here, plus she has been quoted as saying that Chaney was the one person most responsible for teaching her what it means to be an actor. But it is of course Chaney who’s the star of the show. He covers the gamut from creepy, to pathetic, to sympathetic, to downright evil, all in one 73-minute film. Many have said (though it’s Burt Lancaster who’s always credited as the first) that Chaney’s portrayal here is one of the most compelling acting performances ever captured on celluloid. The greatest screen performance by one of the most talented performers the screen has ever seen – how can you possibly pass that up? The Unknown is one of my favorite horror movies, if only because it’s something so outrageous that only a team like Browning and Chaney could pull it off. This is always the film I steer people toward if they are of the belief that all silents are “boring.” The Unknown is anything but, and while it may not horrify you, it is guaranteed to make you drop your jaw and look at the possibilities of silent film in an entirely new way.